Photo courtesy of Stone River Outdoors, LLC. We decided to write this article from a survivalist viewpoint. After slogging through the jungles of Southeast Asia and the mountains of the American Southwest, it became apparent that most folks need a few pieces of equipment that are not always available. The first is a source of good rope or parachute cord for emergency use. However, few of us venture into the outdoors away from camp with anything more than a couple of feet of line, if that. The folks at Stone River came up with a very practical solution for that problem. They designed a survival belt that is comfortable to wear, durable under the toughest conditions and with enough paracord to handle just about any emergency situation you might encounter. The S.R. 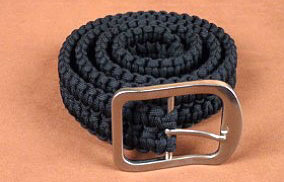 survival belt is double braided from 500 weight paracord, not the cheap stuff you find in most stores. We say that, because there is a lot of imitation parachute cord being sold on the market. It looks like parachute cord, feels like parachute cord; but, generally has a strength of less than 150 pounds. That is not enough to lift a normal man out of a hole or pull someone up a hill. The survival belts come in three sizes: Medium for waists of 32-36" (SRG1SBM*), made with two 51 foot strands of paracord; Large for waists of 38-42" (SRG1SBL*), made with two 55 foot strands of paracord; X-Large for waists of 44-48" (SRG1SBX*), made with 62 feet of paracord. Each belt is fitted with a heavy-duty zinc belt buckle for durability. They are available in three colors: black (*B), olive/tan (*O) and green (*G). In my sixty years in the field, I have never experienced a situation where I had too much rope. That is why I ordered the large belt, even though my waist measurement is slightly over 32". The extra slack easily tucks into my belt loops. If we ever get into a bind in the field, all we have to do is cut the end and unravel the belt. We then have all the rope needed to drag out a deer, reinforce the tent, or provide an emergency lifeline. With a little practice, Mary has learned how to re-braid the belt, sealing the ends with her lighter and we are ready for another trip. With an MSRP of $59.95, the Stone River belt is comparable in price to leather belts or high quality web belts, but much more versatile. The S.R. Survival Belt can be ordered directly from Stone River Outdoors on their website at http://www.stoneriveroutdoors.com. We ordered a belt for everyone in the family and a couple extras for our guides (they aren't getting mine).